When he was alone in an Orlando hotel room, a piece of atherosclerotic plaque broke free in Lucky Jain's blood vessel, perhaps while he slept or dressed. As he strode to the conference room where he was to give the opening lecture of the annual neonatology board review, a clot began to form. It traveled silently, painlessly, toward his heart. When he climbed to the podium to address his colleagues, as he had done for 20 years, the clot suddenly and without warning blocked his left anterior descending artery. He waswaving to a former resident when he fell wordlessly to the floor, pale, without a pulse, not breathing. A videographer instinctively yelled, "Is there a doctor in the house?" momentarily forgetting the hundreds already moving toward Jain. Chest compressions brought him back, at least part of the way. He remembers the EMT's standard question, "What's your name, doc? What's your name?" And he remembers the smile he got when he whispered a response. Lucky. Only one in 20 people survive such severe cardiac arrest. Of those who do, many suffer irreversible brain damage. Time is key. An hour after Jain's collapse, Emory-trained Mark Steiner, director of cardiology at a nearby hospital, had removed the clot and put in a stent, restoring blood supply to Jain's heart and brain. Jain—Richard W. Blumberg Professor of Pediatrics and one of Emory's busiest neonatologists—had become a patient. Physically fit, a serious tennis player still at his college weight, he hadn't seen it coming despite a family history of heart disease. The first week was touch and go. 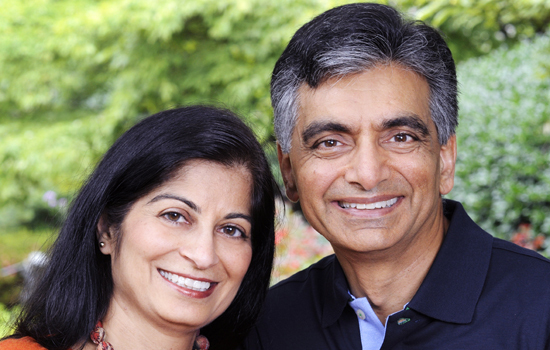 A ventricular-assist device kept Jain's heart pumping. Back home, under the care of Emory colleagues led by Douglas Morris, he wore a defibrillator, ready to shock his sluggish heart back into action if it stopped. He spent three months in the cardiac rehabilitation program. Did the patient experience change him? You bet, he says. On a personal level, he slowed down to a somewhat less superhuman pace. "I had done so many things on the assumption that only I could do them," he says, "but when I looked around, I saw talent everywhere." He delegated more. He began to meditate. Instead of eating on the run, he now savors each bite. He spends more time with those he loves. He smiles more, says thank you more often, hugs more people. And as a clinician, he emphasizes the personal, emotional, and spiritual aspects of patient care more. Jain's wife Shabnam, an Emory pediatric emergency medicine physician, had refused to leave her husband's side while he was a patient in the ICU. His awareness of her presence gave him a new appreciation of the role that families play in "keeping their loved ones going." And not just families. Jain still tears up when speaking of the strength he gained from the concern of friends and colleagues. Like most clinicians, he always had been careful to be as honest as possible when discussing possible outcomes. Now, having been at the opposite end of those difficult discussions, he tries to "keep the door of hope open" as wide as possible. In Orlando, a young nurse gave him a small stone statue of an angel, promising to pray for him. Not a formally religious man, Jain nonetheless clung to the angel for days. He now encourages patients and families to draw on any available spiritual resources, without too much concern for what they are, "since they all lead to the same Almighty and all provide strength," he says. And finally, Jain says that his faith in the U.S. health system, already high, went up many notches in light of his recent experience. "I am so proud of what we have here," he says. "If one of the conference center waiters had collapsed instead of me, the response of the physicians, EMT, ambulances, the hospital, would have been the same." Winship Cancer Institute nurse practitioner Jessica Thomas doesn't mention her bouts with the disease to her patients, but sometimes when she herself is sitting in a Winship waiting room, one of them sees her and looks quizzically. "Oh yes," she says then. "I'm one of you." Thomas was 20, a University of Georgia student preparing to transfer to Emory's Nell Hodgson Woodruff School of Nursing, when her doctor discovered a melanoma on her back. She did a quick web search on melanoma, and her heart sank. Referred to Emory, she had the tumor and surrounding tissue removed. "Thank goodness that's over," Thomas thought, but the profound experience pointed her toward oncology. After graduation from nursing school, she joined Emory's bone marrow transplant unit. Then, when Thomas was 24, another Emory dermatologist found a second melanoma, which she also had removed. She began to see medical oncologist Dave Lawson regularly. The following year, a third melanoma appeared. Now 28, Thomas has had at least 20 biopsies—"you lose count," she says—and she jokingly describes her scarred back as a Picasso painting. Although Thomas is selective about sharing her experience with patients, she always practices the lessons learned. As her Emory doctors have been with her, she is deliberately unhurried with her own patients. She knows how important her family and friends have been to her and how essential that they are included in discussions and plans. And, most of all, because she was so young when she realized that cancer would be a recurring theme in her life, she tells her patients that they can incorporate cancer into their lives without making it the focus. "No matter what the prognosis, live your life every day," she says. "Hold friends and family close. Do what you love." That means clinicians need to go beyond medical protocols to recognize what is important in their patients' lives and help to make that happen. It meant the world to Thomas when oncologist Keith Delman shifted the date of one of her surgeries so she could run the Chicago marathon. One reason that health professionals generally keep their own medical challenges to themselves is fear that the information will take the focus away from the patient's needs. For example, when one physician found that several of his long-term patients learned of his diagnosis with a potentially serious chronic illness, they became less forthcoming in describing their own symptoms. "They didn't want to worry me," he says, "but of course I worried this made it harder for me to take care of them." "I like to think I was already pretty empathetic," says another doctor. Still, he believes that his life-threatening diagnosis made him more understanding of patients' perceptions. "If something worries patients enough to make an appointment and get to my office, I take their experience very seriously," he says. Being told he probably would die young (he didn't) also convinced him to live life to the fullest, knowing it could end at any moment. That meant marrying, having children, enjoying sports, and practicing medicine full tilt. "Taking care of patients is such a privilege, such a joy," he says, "it would be a shame to let worries over my own health spoil it." Sometimes the lesson is in the details. One physician found himself bothered by water stains on the ceiling tiles during the several days he spent flat on his back in an out-of- state ICU. "Who would have thought something like that would matter when you were ill?" he asked himself. Back in Atlanta, he walked through Emory University Hospital Midtown, looking up and reassured that the ceilings his own patients see were perfect. Shen Tsun Wang—Jim to engineering colleagues at the University of Kentucky—became critically ill during a Danube River cruise and was placed on a ventilator at the largest and one of best academic medical centers in Europe, Vienna General Hospital, where he subsequently had a stroke. Emory hospitalist Alan Wang and his brother Stephen, also a physician, flew to their father's bedside. Although treatment was excellent, family involvement was severely restricted. The sons had their father air-lifted to Emory University Hospital's Neuro ICU, which emphasizes programs and spaces that tap into the powerful role of families in healing. Here, they were updated often and included in all medical decisions. Wang's mother, Lung-chu, was allowed to stay with her husband around the clock, which visibly lowered her anxiety and accelerated their father's recovery. As chief medical officer at Emory Johns Creek Hospital and director of hospital medicine for Emory Healthcare, the younger Wang had helped implement patient- and family-centered medicine across all of Emory's hospitals. Now he knew how much family involvement really meant, developing a new appreciation for the patience required of families. As a physician, he often felt busy without a moment to spare. However, as a family member waiting for clinicians or test results, time seemed to slow to a crawl. Finally, as his father moved on to Emory's Center for Rehabilitation Medicine, Wang began to realize that hospitalization is often only the tip of the iceberg of patient care. As a result, he now intentionally takes more time at discharge to help patients and families with expectations for their progress and prepare them to follow up on medications, referrals, and other long-term issues. And the senior Wang? He's back to walking several miles a day and reading prodigiously. When Emory Healthcare nurse Kelly Brewer Shelby returned to patient care before her hair grew back, she always wore a wig. She didn't want patient encounters to be about her, she says, "but if a patient opened the door about her own struggles and if it seemed my experience might be helpful, then I told her." Shelby's experience seemed especially helpful to women with or about to undergo testing for the same condition, since there are few survivors with whom they can talk. In January 2010, three months after getting married, she had been diagnosed with an ovarian cancer the size of an eggplant. She underwent surgery and a long sequence of body-wracking chemotherapy. Lessons learned? First, Shelby says she gained new empathy for patients who, like her, are suddenly faced with something as "ominous and odious as ovarian cancer," but who, unlike her, "have to navigate a complex health care system they may not understand well at a time that they are most frightened and vulnerable. " Second, she saw how much it meant to her, as a patient, when her doctors and nurses recognized the anguish and worry of her new husband Kent and took time to take care of him. "Serious sickness is sometimes almost harder for family members than for the patient," says Shelby, "because they can't do anything. They can't take away your nausea, your baldness, your pain, your fear. Those clinicians who talked to Kent or gave him something useful to do—telling him where he could go to buy a special sandwich for me when I was in the infusion center, for example—gave us both a great gift." And third, she realized that some of the most meaningful connections during her treatment came from the simplest things. A medical student on rotation with Ira Horowitz, her gynecologic oncologist, came in every morning and knelt down on the floor so that he could look her in the eyes to ask how she was. "I realized that often what a patient most wants, more than information, more than comfort, is to know that somebody really cares how they are doing. And this student, like Dr. Horowitz, really did." Two years after her diagnosis, Shelby regularly talks to medical and nursing students about her experiences as a patient. (Interestingly she taught Jessica Thomas—also profiled in this story—when Thomas was a nursing student.) "They ask wonderful questions," she says, "about how to talk about difficult diagnoses, how to include family, how much information to provide (my husband could handle only limited amounts, for example), and how to conduct themselves in the most helpful way. "I share what I learned as a patient and as a nurse: your patients will always give you more than you can ever give them," she says.